Doris and Dot Boyette were daughters of Eddie D. Boyette and Mattie Deen Boyette. Their home was in Lanier County, just east of Ray City. Carolyn DeVane was a daughter of Caulie A Devane and Alma L. Albritton, and sister of Harold Elmore DeVane who was serving in the Navy. She grew up in the Lois community just west of Ray City, GA.
Marian Hambrick, sister of Thera Hambrick, was a daughter of Ruth and John O. Hambrick. Her family’s place was in the Cat Creek community, just southwest of Ray City. Louise Paulk was a daughter of Gladys Daniels and James M. Paulk. Her father died when she was a toddler and her mother remarried Hun Knight. 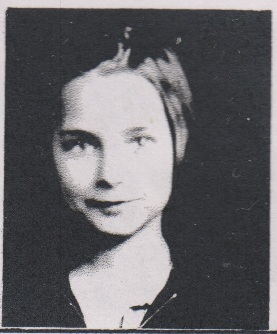 Her step-father was the owner of the Mayhaw Lake amusement park at Ray City. Her half-brother was Jack Knight, who attended college at Valdosta after the school went co-educational. Marilyn Faye Weaver was a daughter of John W. Weaver and Irene Guthrie. The Weaver farm was just east of Ray City in the 1300 Georgia Militia District in Lanier County, GA.
Marilyn Weaver, 1949, freshman at Georgia State Womans College.